Do you want to help build power in low-income Asian immigrant for social change? CAAAV volunteer shares “History of Chinatown Organizing” timeline with Chinatown residents in the park. What Have CAAAV Volunteers and Supporters Achieved? In May 2015, our Fundraising Committee raised $24,142 for CAAAV by organizing our annual Dance Battle fundraiser. As a non-profit, donations from supporters like you cover costs of supplies, space, and staff it takes to win social change. 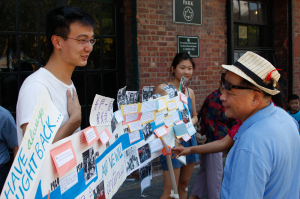 In 2014, volunteers fluent in Bangla, Cantonese, Korean, and Mandarin surveyed 221 Asian NYCHA residents to compile data for the first-ever report on the experiences of Asian immigrants living in public housing. In December 2014, our volunteers put their bodies on the line and participated in civil disobedience to demand police accountability the day after the announcement that NYPD officer Daniel Panteleo would not be indicted for the death of Eric Garner. And much more…SO GET INVOLVED TODAY! Want to learn more about us so you know how best to take action? Check out our programs led by our Asian immigrant leaders.